Someone was posting the shopping days until Christmas on Facebook the other day and it made me chuckle! I'm not in THAT much of a hurry for Christmas to come, but I do enjoy getting a head start on my Christmas Cards!!! Soooo I'm hoping this challenge gets you motivated for making your Holiday cards, what ever holiday you celebrate and enjoy! For my Christmas Card I used the very pretty Vintage Tree cover a card stamp as my base. 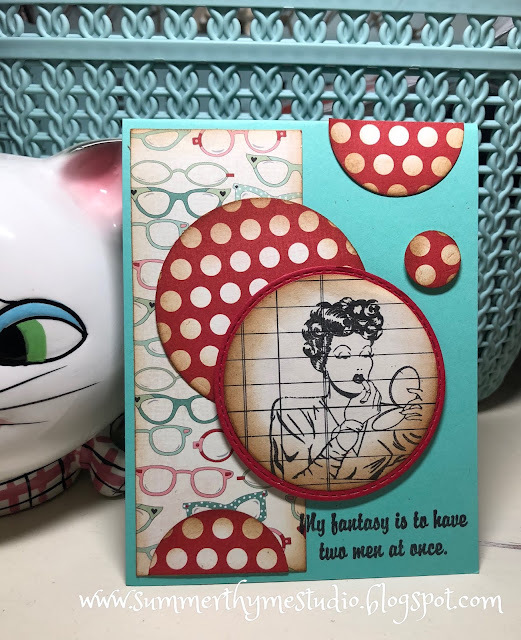 I wanted to do the card in a Vintagy sort of way, so I chose to stamp Teal Ink onto some Soft Sky cardstock. Keeping this theme in mind, I chose Snowman Wreath for my main image. I stamped the image in Seafoam in order to get lineless coloured look. I LOVE the IO Hybrid Inks because they are perfect for this technique. They don't smudge and dry quickly!!! YUMMY!!!!! So I coloured the little fellow in Copic Marker, Adding some Signo Gel Pen Snowflakes and highlights! Super fun!!!! stamp to drive it home! lol.... I am so silly! Anyhooooo, would love to see your creations. Sorry I'm late to the hop this morning! I was having some trouble with my computer, but it's all good now!!!! I'm back to Halloween today to share this little spooky confection!!!! 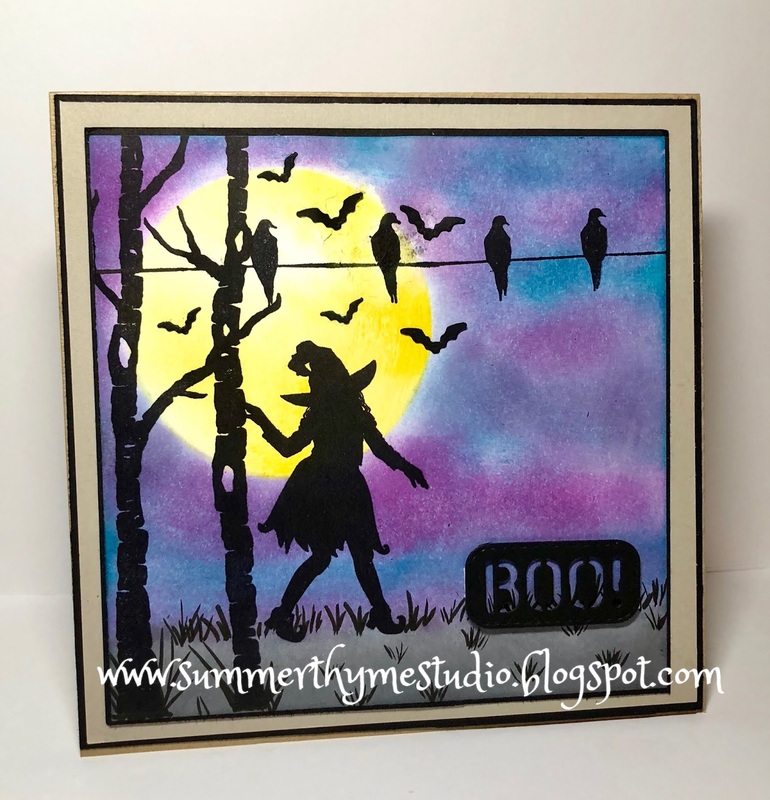 I enjoyed creating the night sky with Tim Holtz distress inks. This is the last day of the hop, so be sure you get around and leave some love on the blogs and you could win a great prize!!!! Hey!! Making it short and sweet today!!! You all know what to do!!!!! Most importantly, I hope your day is AMAZEBALLS!!! Welcome to day two of the IO hop!!!!!! For those of you who are curious about yesterday's post. ATC (Coins) seem to be a rather new phenomena.... well new to a lot of people including me. They are made with a 2.5 inch circle and super fun to make as are ATC cards!!!! mini ghosts. 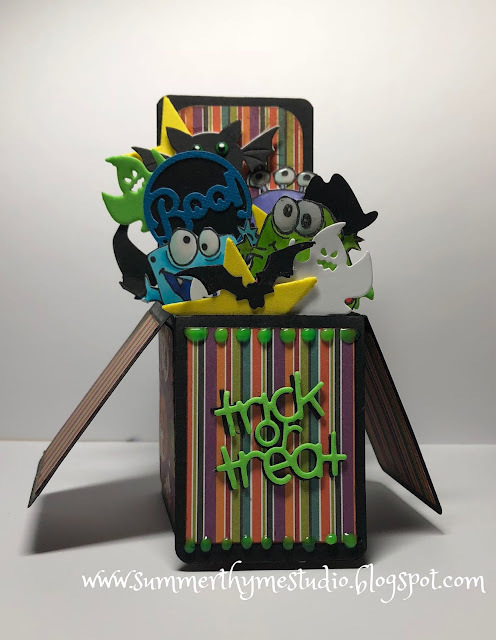 Such a fun card to make!!!! I used some Nuvo Glow Drops in Apple Sour to make it extra fun when it glows in the dark!!!! Welcome to the Impression Obsession 2018 Fall/Winter Stamps Release Hop! The Blog Hop will be posted on the Impression Obsession Blog at 6am EST July 16th – July 19th. 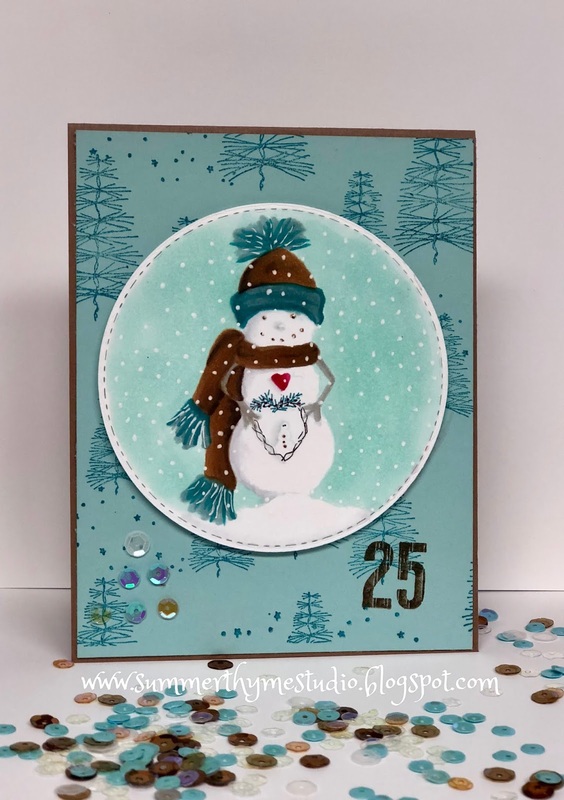 Visit our fabulous IO Design Team’s blogs (only one comment per blog please) for a chance to win one of FIVE $25 Gift Certificates! The more blogs you visit … the better chance you will have to win!!! Comment entries will be open on all posts until 9pm CT on Sunday July 22nd and all winners will be announced July 24th. I Love both of these sets and can foresee using them over and over!!! I Love how these all turned out. 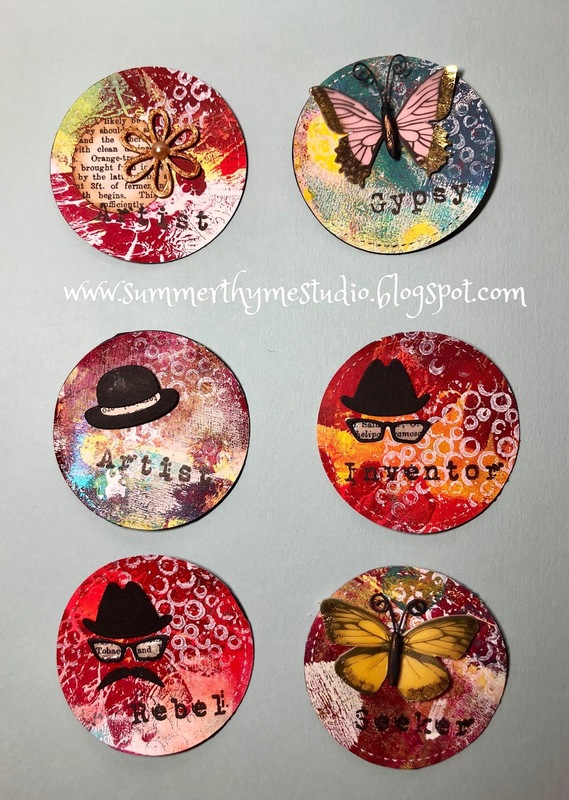 I made quite a few for an AtC Coin swap!!! Here's who is hopping today! See you tomorrow with more fun samples!!! Good Morning!!!! Hope all is well with you and that my Canadian and American friends enjoyed their special holiday this week!!! Today's challenge is happy colours. 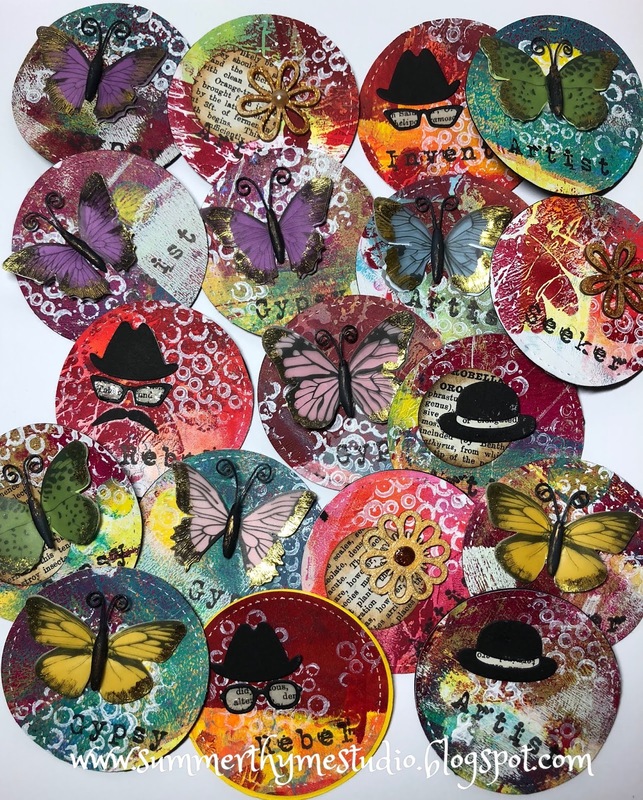 I couldn't really settle on one colour, so I looked to my collage sheets to find a happy colour combo that caught my eye. IT really was a quick and easy card because I added the sentiment using the Happy Stamp and Happy Die. If you look closely, you can see the shadow I stamped on the background with Periwinkle INkle....oops, I mean Ink! hehe!!!! Super Quick, Super Fun,,,,,some of my FAVE Colours! 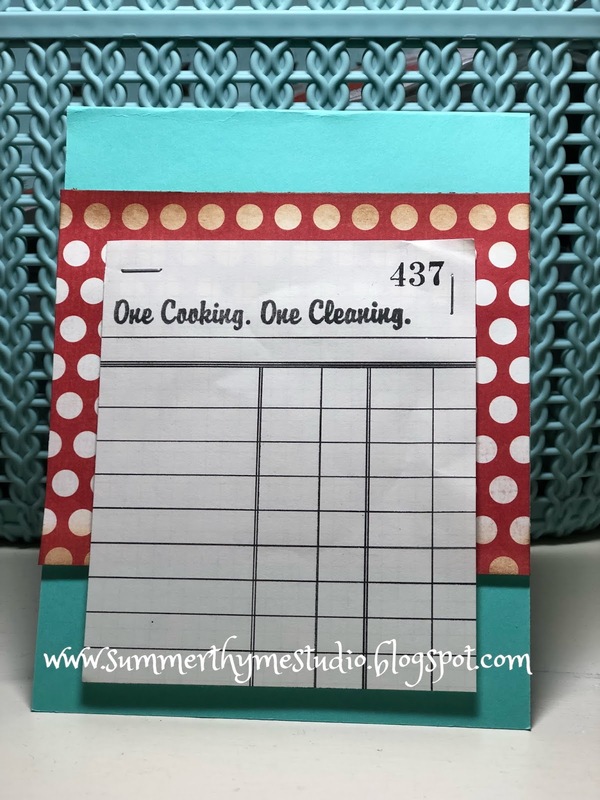 Link them up on the IO blog for a chance to win some stamping bucks!!!! Check out the FABBY DT!!!! 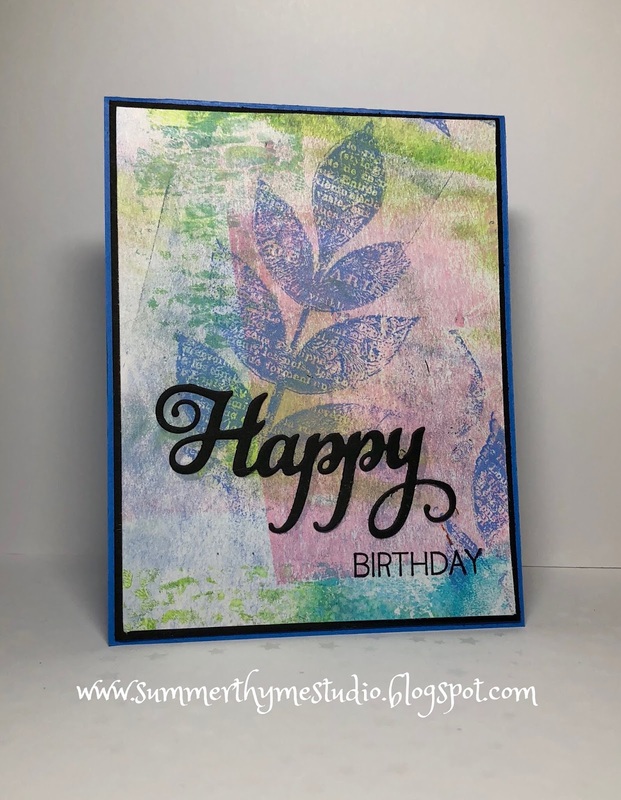 Happy Canada Day to all my friends this side of the border and welcome to Technique Junkies Stamps July release blog hop. If you've been hopping already, you've arrived from my dear friend Ceal's blog. I have been on several design teams with Ceal over the years, but just recently met her face to face at a retreat in Texas in May. She is one of the sweetest people I know and I look forward to a time when we can meet again!!!! 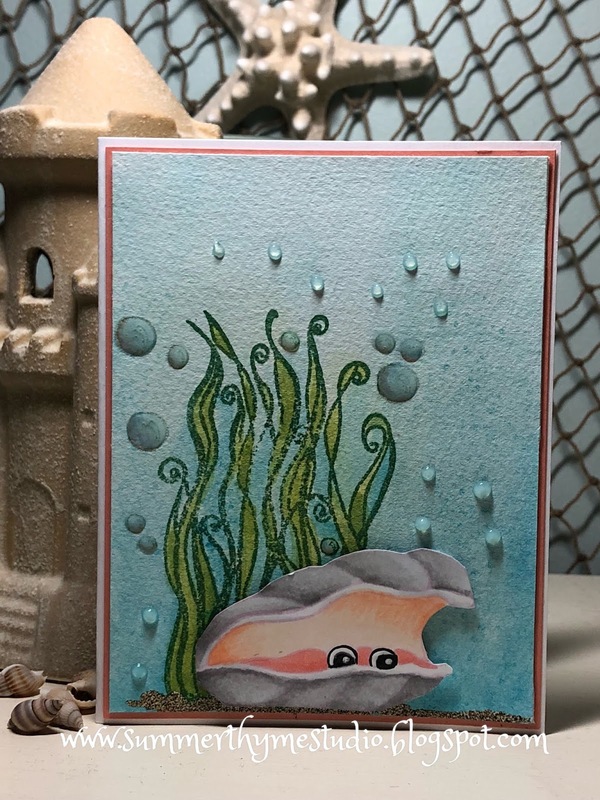 I sponged the shells with IO Hybrid inks in Blush and Pistachio. I created the bottom panel by stamping the Fun Starfish background and added a touch of Nuvo Drops in Golden Sunset. 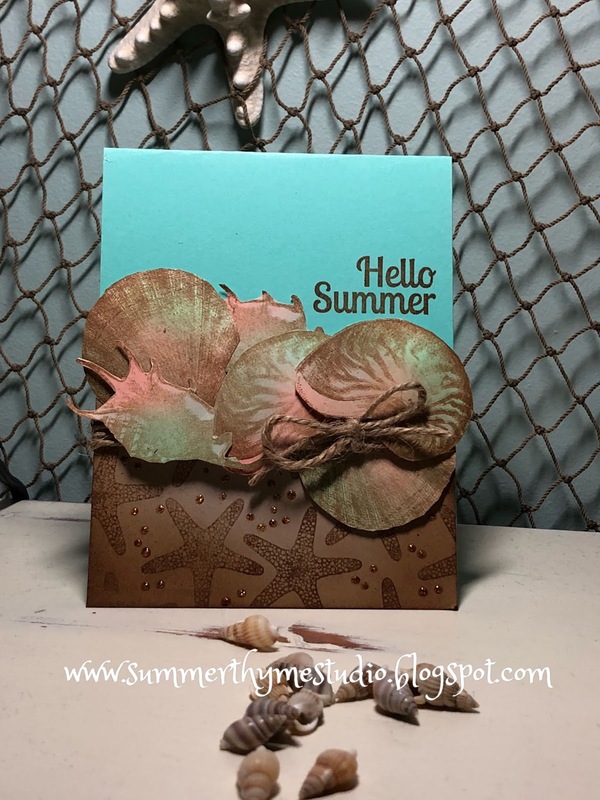 Lastly, I used the sentiment from last summers Watermelon Summer set. 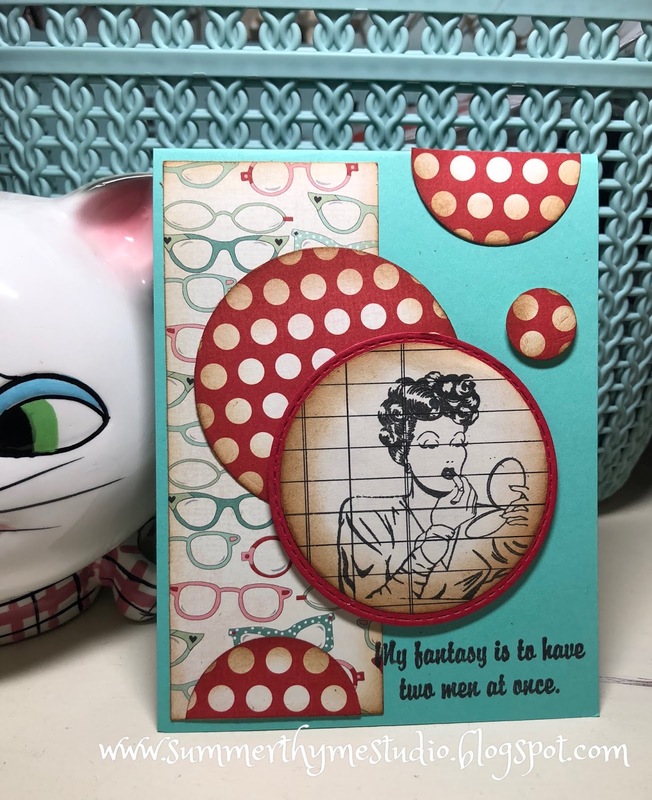 Although there are two amazing sentiments in this set, I could NOT resist how this little stamp fit so perfectly on the card!!!! LOVE these shells and I can see myself using them time and time again! 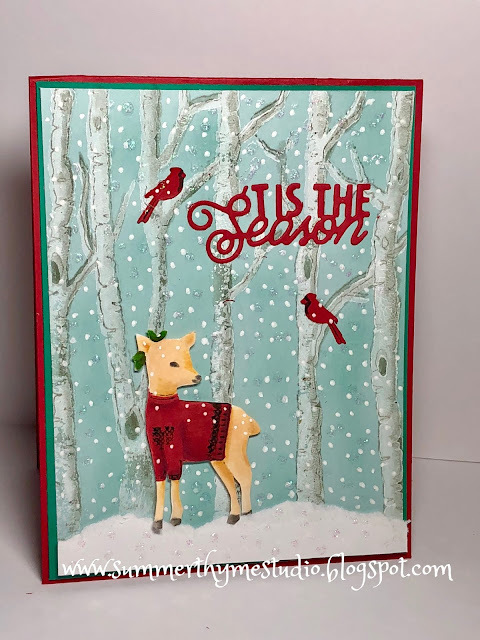 I was SO excited to get this awesome Inside and Out sentiment set! The little eyes peeping out just make me want to smile!!!! So that's it for now, I'll have some other fun projects to show you later this month. 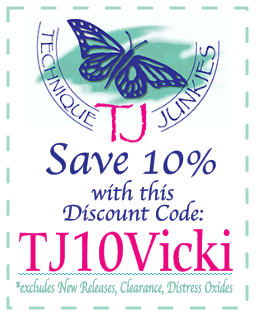 Don't forget the new release stamps are on sale until the 10th of July and you can use my code to save 10% on any other stamps that aren't new release. 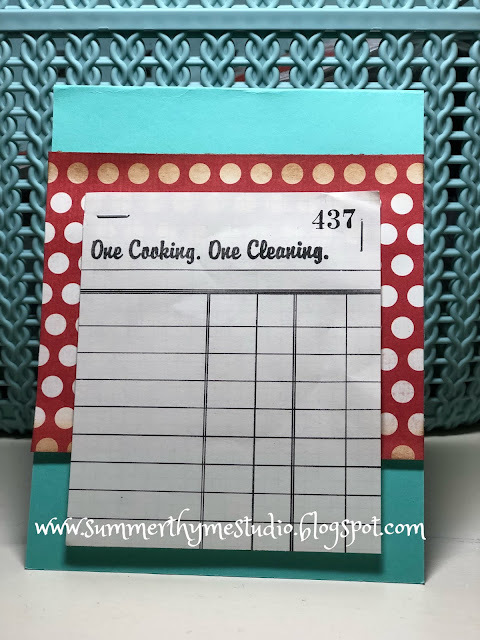 Now head on over to my Bestie Jeanne's blog, 'cause I know she is going to have some amazing blog candy for you!! !